stravi757 had the most liked content! I pulled them out, they were NOT good for my build. IMO these are for a car you intend to race/autocross. I am looking into designing a new mount for the transmission as the stock insulator does a good job of reducing vibration in the car, but it has too much give at the same time. We will find out soon! Is there anything you have tried I havent mentioned? Whoa. is your set the poly or rubber style. Come to think now I probably would prefer the rubber, but would give the poly a shot too. Did you ever run them? how did they feel? On their website they have this posted. https://www.mckinneymotorsports.com/prod_motor+mount+styles So it looks like these are options to swap/replace between rubber, poly, semi solid poly, and aluminum. Thought I would share this with everyone. 1978 280z l28 280zx 5speed, Stock EFI(for now) To give a little back story. 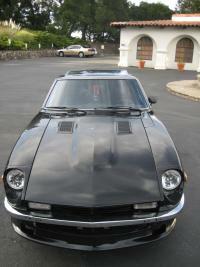 I daily drive my 280z 19878, so comfort/quality drivability is important to me. As we all know the Z cars are known for having a "clunk". After replacing everything from the motor mounts to the half shafts, the car drove very well. I was enjoying life for a while. But as I continued the drive my car more and more, I found myself dissatisfied with the drive quality again. So I began looking for more things to change. I went ahead and installed 350z seats, those made a huge difference. After that I continued to try more things out. -I did the Technoversions front diff mount https://www.technoversions.com/DiffMountHome.html -Polyurethane bushings on everything excluding the rear inner control arms, and the TC rods -3.9 SUBARU R180 LSD This is pretty much what i have done so far, and dont get me wrong, the car drives really well. But I still feel kick between On and Off throttle that gets on my nerves a little bit. So My next idea is, filling in the stock transmission mount with Liquid urethane http://www.energysuspensionparts.com/diymmi I used a new Nissan mount. Im waiting a couple more days for it to cure, and then will install and post results. They are real soft stock, so we will see how much of a difference this makes. I know I can see my shift rod move a good amount when giving the car gas. After this my next things in line are Lokar cable throttle, and motor mounts. I bought the cable throttle already but Im still working on how I will install it. I would like to use KTM's design, But I haven't figured out how to put together a kit myself, or to see if KTM still has one laying around for sale http://www.zcar.com/forum/10-70-83-tech-discussion-forum/276091-throttle-cable-conversion-kit-interest-does-not-require-different-throttle-body.html Im sure this will be a huge improvement also! As Far as motor mounts. Right now I am running New oem. I tried using https://silverproject.eu/en/shop/nissan/solid-engine-mounts-for-datsun-240z-260z-nissan-s30/ But they are a little rough, as my dash was vibrating at idle. But they did feel smooth while driving. I may give them another shot, or maybe try using one solid mount and one rubber? I really wanted to try the Mckinney Poly mounts, But Those are NLA So I Hope this helps anyone looking to solve or improve their Z's drive quality. And If anyone has any tips or advice, please share! would love to hear feedback, Ideas or things you have tried as well. UPDATE: I installed and ram the urethane filled mount. It was a disappointment for what I was trying to achieve. There was to harsh of vibration coming into the car from it. Its not so bad while driving the car once your going 25mph+. But at low speed, especially starting out in first gear, it vibrates a good amount throughout the bell housing. It felt a little like there was a mild missfire on a cylinder. Maybe if I had dynomat installed it could have helped out, but it its a fairly harsh vibration. Its did improve the throttle response on acceleration though. I could really tell when stepping on the gas in 3rd gear. UPDATE: December 3, 2018. After almost 8 months of waiting I finally got the rubber style motor mount insulators(which they sell still) from Mckinney Motosports to pair with their 240z-280zx motor mount set-up(which is NLA) Wow! They are amazing. I had in my head an idea of what they would feel like, and they are better. They was no significant increase in vibration at idle(silverproject mounts shook the dash) or at driving speed. The throttle response of the car is much better on acceleration, and it feels very smooth on deceleration 2nd gear and up. I havent driven on them too much yet, so Ill add more details on them as I put more miles but four thumbs up on these!!!!!! Thanks z240 for selling me your Extra set! I may have to look into a different companys rear package to use the willwood E-brake caliper on the rear it looks like. thanks for sharing this. So AZC has made two styles of caliper brackets. The first version was using AZC's self made E-brake calipers(which you say they never produced the caliper itself). The Second version caliper bracket AZC claims to have uses a willwood E-brake. AZC sold me the rear willwood E-brake calipers but said they did not have the Brackets to use them in stock yet. I called AZC a couple times and they keep saying the will be in stock shortly but they still havent got them. Arizonazcar doesn't have the rear caliper bracket which includes the parking brake caliper in stock. If anyone has it for sale let me know. I am also interested in either buying or possibly trading for 280z front rotor centers. Mine are for a 240z. NOTE: AZC has made two types of rear caliper brackets. need the second version which uses the Willwood style parking brake caliper. Both brake wires should be looming right by the brake light switch. If the wires arent in sight, Maybe you might want to take the dash out, who knows what other mysteries could be under there! Have a wiring diagram? Yes - another Brake Thread. S12W and drums? IMO Id keep my brakes stock, or go willwood setup. I don't see much value going the Toyota caliper route. still looking. anyone have a set of z therapy for sale? Thanks for the response, Im going to continue to watch videos on tracking down short circuits, up my electrical knowledge! See If i can give some better descriptions to solve this.